Specializing in mobile on-site document destruction. Heartland Shredding, Inc., offers secure on-site confidential document shredding and recycling services to businesses of all kinds and sizes. We are a locally owned and operated family business serving the Cedar Rapids, Iowa City, Grinnell, and Des Moines areas specializing in on-site document shredding. 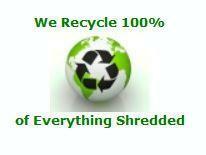 We can provide cost effective solutions for your sensitive document shredding. Call us today for more information. Reviews for Heartland Shredding, Inc.